COLLEGEDALE, Tenn. --- In a decision widely celebrated by new and returning students, Southern Adventist University has greenlighted student dance parties on campus as sanctioned social activities. The new regulation comes with two caveats: dance parties of any size must be called "mime workshops" and students must wear body paint. "Adventist churches have for decades allowed young people to perform mime to highly uptempo music with a drum track," said Adventist Historian Pehrm Iscive. "The moves these church kids have pulled off are dance moves. As with so much in Adventism, it's all in what you call it. Southern happens to have picked up on this and is running with it." Southern's administration has pushed back forcefully against Iscive's argument. "Moving joyfully and enthusiastically to music with your face freshly painted is clearly not the same as dancing," said University Spokesperson Ehn Dehnayal. "That's like saying the stretch and flex classes that have been taught for years at Adventist schools are really yoga." 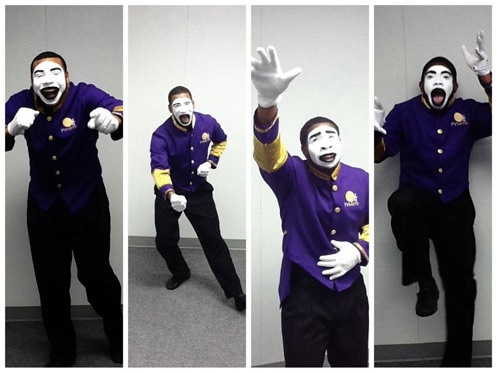 Since the announcement, administrators in charge of student life have received a torrent of event registration requests from student organizations and private groups wishing to host on-campus mime workshops everywhere, from outside the administrative offices of Wright Hall to poolside in Iles Physical Education Center. Back when I was a student there, we learned “square marching” so mime? Nope…MARCHES! I love the name of the Adventist Historian, “Pehrm Iscive.” Yep, it’s fine to be “permissive” if you call it by another name. “As with so much in Adventism, it’s all in what you call it.” The name of the spokesperson, “Ehn Dehnayal” is great too. Seems like she is “in denial.” Clever, sevvy! ADVENTIST LIFE WOULD BE BETTER IF WE JUST PRACTICE OUR CHRISTIAN FREEDOMS AS PAUL WROTE ABOUT IN HIS LETTER TO THE ROMANS, THIS LETTER AND ALL OF THE OTHERS ARE TRULY GOD INSPIRED AND NOT AS WHAT IS SUPPOSED FROM EGW. BUT SERIOUSLY, A DANCE DEBATE? SDA LOVE THE BURDEN OF THE LAW DON’T WE? Oh oh a long step down a slippery slope . . . once you start moving to music you never know where it’ll end . . . and “face paint” is very perilously close to “make up” . . .
Slope? What slope? You mean like Aspen? That snow is really slippery. I better get my skis out. What would Doug Batchelor and his twin brother say about this? What would Donald Trump and his twin brother say about it? Donald Trump would approve of this new policy. It fits right in with The Donald Trump Scandal No One is Talking About. Since his “university” is in serious hot water, I wouldn’t be surprised if he looks for a job in the peaceful valley of Collegedale. He could lead the mime dance club. Could call it “Art-Tinged Cross Training” !!! Southern is currently building a “mime club” beside the Village Market. It will feature strobe lights, disco ball, fake smoke, light sticks, a DJ with the latest Hip Hop beats and electronic mime music, with Postum and Martinelli’s Sparkling Cider on draft. Popular “couple-mime” moves will include the hustle and the grind. Hollywood has already gotten whiff of this hot new attraction, and is gearing up to make new versions of some classic 70’s and 80’s disco films, such as “Saturday Night Mime Fever” and “Dirty Miming.” Of course, SAU administrators will be hand to ensure that nobody is dancing. “Of course, SAU administrators will be on hand to ensure that nobody is dancing.” ROFL! Along with the Postum and Martinelli’s, they should serve Carob and Little Debbie’s too. HEY THERE WALT, HOW’S THE ICE BOX? Given that Southern is likely the most conservative Adventist college, it’s ironic that Southern would be the first to allow dancing, err, I mean “miming.” But I won’t really be surprised until it is approved at Weimar and Hartland. It might even have a chance there if they just call it “Vegan Mime.” Anything vegan is okay. How about “vegan dirty miming”? Or the vegan lambada-mime? This is nothing novel. Liturgical dance has been a staple of many churches for a long time. Some call it “liturgical dance,” and some call it “mime.” Some even go so far as to call it “sign”–when it has nothing to do with any real sign language. Southern has had a traveling “sign”/mime group for several years. They do their moves to recorded gospel music. SO TRUE. THE JEWS ENJOY DANCES. HMM WHY DID WE NOT CHERRY PICK THIS ONE? I grew up with the old fashioned marches to the beat of Kenny Griffin’s organ music. I miss those good old days! What happens if one wants to say a prayer in “mime”. Nothing to it!! What’s next? Hip Hop, Reggae, JZ Rock? I’m marching in with the saints when those saints go marching in!! O rock me in the arms of Jesus. Woe is me! This site is a disgrace. The owner is perpetrating lies in the name of “satire.” Satire is one thing; lies are another. This site is neither one. Shame on you. And you can stop hiding behind that silly screen name “sevvy.” We know who you are; we have identified you as Leonard N. Tolstoy of Tempe, Arizona, phone number (480) 555-1212. Why not use your time, talent, and effort to write something true and worthwhile, like War and Peace? Nobody even reads this site anymore; and all the people who write comments are a big bunch of losers. OKAY SO YOU IDENTIFIED, SO WHAT? ENJOY THE SITE OR LEAVE. YES ITS SATIRE BUT THERE ARE ALSO GOOD DISCUSSIONS.